Are you wasting money without realizing it? We all do it at one point or another. It’s not until that light bulb moment goes off that you realize exactly what’ve you done. Sometimes you waste money by not paying enough attention and at other times you actually think you’re saving. I’ve been there. Done that. With the best of intentions my efforts to save have actually cost me money. And they might be costing you, too. 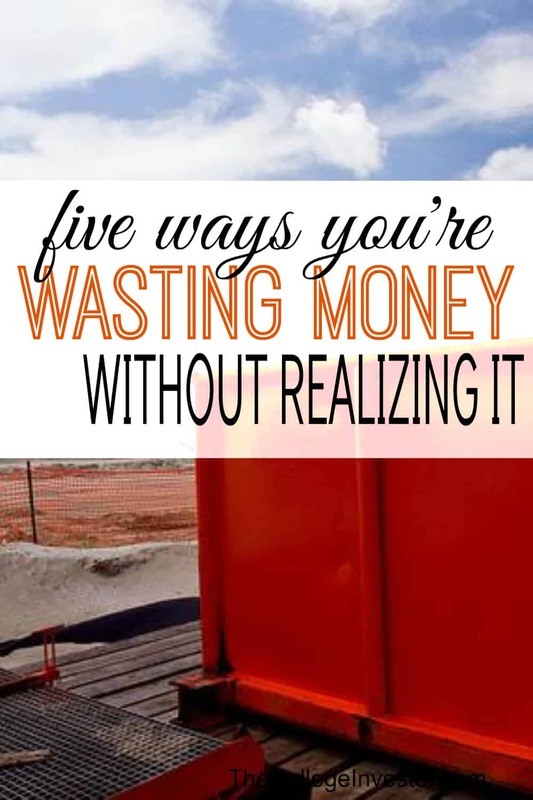 Here are five ways that you could be wasting money. When you find an amazing deal you get an adrenaline rush. It makes you feel really good for a little while regardless of what the deal is. And there lies the problem – finding great deals is all about the hunt not the end result. This is something you have to be really aware of. If you’re taking advantage of deals on things that you didn’t need in the first place you’re not actually saving money, you’re spending it. I like to think of my budget as always being $0 per month. Everything I spend on needs to be a choice. And when I do spend, I make sure I take advantage of all the ways possible to save money. Beyond deals, what about getting paid for things you already do? This is one of the things I love Ebates for! Ebates is an online rebate center where you can get rewarded for the shopping you already do. I earn about $100 per month by simply going to Ebates before all my online shopping! The thing that most annoyed me about TLC’s popular show Extreme Couponers is how the couponers would claim to be “saving” all kinds of money but were actually just getting items they’d never use. Coupons can do that to you. When you see you can get something that normally costs $10 for only a $1, you want to buy it! The problem is if you’re spending that $1 on something you’re not going to use you aren’t saving money – you’re wasting money! The same also goes for free things. You’re not actually saving money just because you got something for free that you’ll never use. You’re just hoarding. This example is exactly like the deal scenario. You get a rush from finding that awesome bargain but truth be told, you’re not actually saving yourself anything! A great tool that helps with this is Ibotta. Think of Ibotta like digital coupons, where you can save money from your trips to the grocery store and more. Get a $10 bonus just for signing up! Do you know how many credit card offers there are available? If not, let me tell you, there is some fierce competition in the credit card market! The credit card issuers are already making bank by collecting interest and late fees, they don’t need to charge an annual fee to make money and many of them don’t. If you’re currently paying hefty annual fees on your credit card then it might be time to make the switch. Do keep in mind though, cancelling a credit card you’ve had open for a long time can cause a temporary hit to your credit score. If you’re in the market for a loan (like a mortgage) then you might want to wait to cancel. Along these same lines, many college graduates are paying interest rates on student loans of 6%, 7%, and 8% or even higher when they could be paying much lower rates by refinancing their student loans. Private student loan refinancing lenders with refinance private and federal student loans to rates starting as low as 1.9% APR (as of August, 2015). Visit Credible to get a free estimate of how much you could save by refinancing your student loans in 30 seconds. If you could realize savings, you can then also receive and compare offers from multiple lenders after completing their short form. I was recently cleaning out my cabinets and the amount of expired food I had to throw away was a little embarrassing. Especially since I’ve been on a recent kick to keep by food bill super low. Over the past year I had been buying a lot of things in bulk from warehouses. While there are things that I definitely save on by buying in bulk (like Powerade, fruit snacks, and juice boxes) there’s honestly also a lot of items that won’t get used before they expire. When it comes cents to cents you can save a little money buying items in bulk. However, if those items get thrown away then it’s a big waste. When you’re buying in bulk only purchase items that you absolutely know will get used up in a timely manner and things that have a long shelf life. It’s cheaper to buy the other items in smaller packages! Do you have a 401k? Does your employer offer a match? If you’re not taking it you’re passing up free money!! Make sure you’re contributing up to the match on your 401k plan. It’s just too good to pass up and can get you closer to retirement without you having to do anything. If you’re not sure of what you should be doing in your 401k, consider using a service like Blooom – which manages your 401k for you for a low monthly fee of just $10. On top of that, Blooom is available to answer pretty much any financial question you may have. Check out Blooom here. 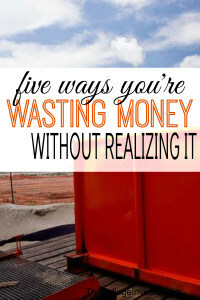 Those are five very common ways of wasting money, however I’m sure there are many more. Be on the lookout. Sometimes our brain tricks us into thinking we’re saving when we’re actually not. Once you become aware of this you’ll have a much easier time overcoming it. What else would you add to the list? Alexa Mason is a freelance writer and wanna be internet entrepreneur. She is also a newly single mom to two beautiful little girls. She chronicles her journey as a single mom trying to make it big at www.singlemomsincome.com. With couponing, there’s definitely a law of diminishing returns. At a certain point, your time will no longer be worth it to clip all the coupons and do all the matchups and store all the stuff and figure everything else out that goes along with it whereas you could have been doing other things that are more valuable in terms of either money, time, or experiences. I completely agree! Plus the fact that couponing and finding those good deals becomes addictive and you end up buying things that you’ll never use just because it’s a bargain. I like your list. My favorite is the 401k match. I mention it to all of my tax customers. It’s just like you found the money in the street. Oh man, the couponing and buying in bulk. I just don’t get it. Only buy what you really need, ever. Who cares if it’s sold in bulk or there’s a coupon for it, will you actually use it? As a tax accountant I think taxes need to be on this list as well. Sometimes people are overpaying on taxes and not even realizing it. Definitely the taxes! That wasn’t something I realized until working for an accountant a few years ago. I had always done my own taxes (they were easy with just a couple of W-2’s) then when I started working on the side and getting 1099’s my accountant checked my taxes and saved me over $1,000! I have to admit “deals” was definitely a money waster for me. It’s a deal why not take advantage of it now before the deal ends. Whether it’s a deal, discount, bargain, sale etc it’s wasteful if the purchase isn’t for something I love or need. It’s not a bargain if I actually don’t need it. Oh boy, can I related. Several years ago I was big on couponing. I’m still using up all the free post it notes that I stockpiled. I also ended up tossing a bunch of free scented air fresheners after years because I started getting more “green” and the smell drove me nuts. What a waste! I can also admit to tossing food or storing it way past its prime because I had purchased a bunch and didn’t want to throw it out. Our family eating habits have changed a lot in the last few years and I’ll probably never eat some of that stuff that I bought in bulk, but I just can’t get rid of it. Thanks for the inspiration. Janeen, perhaps you could donate some of your unwanted stockpiled food items to a soup kitchen or shelter. The buying cause it’s a bargain I can relate to, years ago I kept buying detergents when they were on sale for 1.99 each I had 12! And then we had to move and I lugged those to our new place and I’mstill using them up! Lesson learned on bargain shopping! One thing people don’t realize they waste money on is children’s clothes. They usually outgrow them long before they wear out, so buying these from resale and consignment shops is a great idea.